Skoog is: A revolutionary tactile cube that will change the way you and your family enjoy, create and learn music. Skoog is a powerful and fun music interface for iPad that opens up a world of ‘musicplay’ to everyone, including those with disabilities. Accessible: Whatever your skills, abilities and musical talents, Skoog’s universal design enables accessible, expressive music-making for children, parents, teachers, musicians and families. Inclusive: Skoog is an instrument that is truly inclusive. For many people with disabilities one of the greatest barriers to making music is the dexterity required to play a more traditional musical instrument. Skoog removes that barrier. Since 2010 Skoog has been helping kids with disabilities find their inner musician. Watch the video to find out more. Enabling: As well as being physically accessible, Skoog’s simple design combined with the software features enables those with learning difficulties to make and play music with peers without the need to learn traditional music theory. The ability to create and control musical sounds is also beneficial for a range of therapies and multi-sensory learning. Supported: Working with musicians, students and educators from all over the world we have built up a range of resources to help make the most of Skoog in the classroom. Skoog comes with access to a range of online support materials including lesson plans, backing tracks and sample packs. There is also a Skoogmusic software platform for Mac and PC as well as the App for iOS. Assistive: Skoog is equipped with adjustable sensitivity to suit a wide range of physical abilities. The multi-dimensional tactile technology opens up a variety of playing options using different body parts. 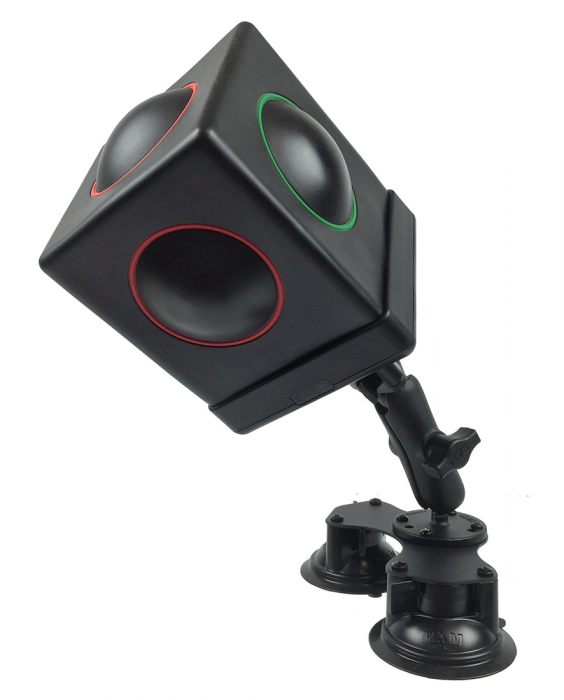 Skoog has a tactile orientation marker and is specially designed to work with a suction mount. Skoog 2.0 comes with a host of exciting features: Including the ability to play wirelessly via iPhone & iPad, as well as integration with iTunes and Spotify to allow users to play along with their favorite music. Skoog integrates with GarageBand and other MIDI apps making it ideal for musicians of all abilities, as well as being the go-to instrument for educators, music therapists and assistive technologists, too. 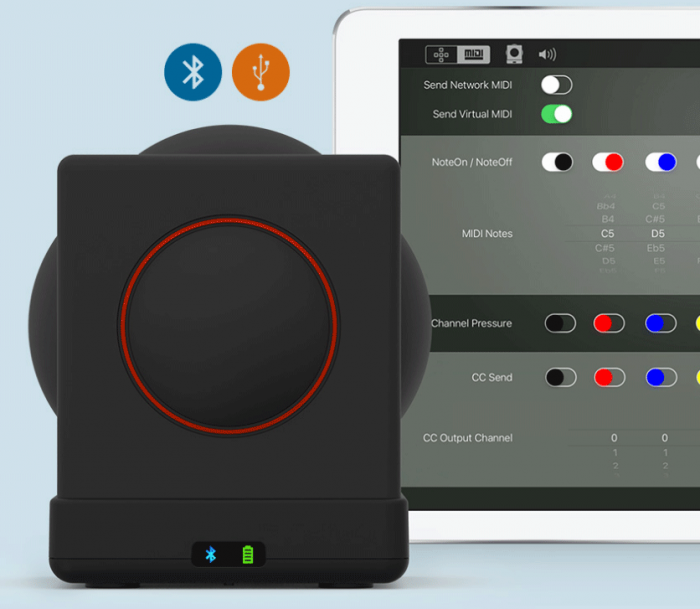 Skoog 2.0: Our new wireless, tactile music interface for iPad and iPhone. Recently featured in TechCrunch, Futuremusic and Gadgette, Skoog has its own free iOS app and will shortly be available in 8 languages (English, French, Italian, German, Spanish, Portuguese, Chinese & Japanese). Skoog 2.0 is still compatible with Macs and PCs as well as iPad and iPhone. 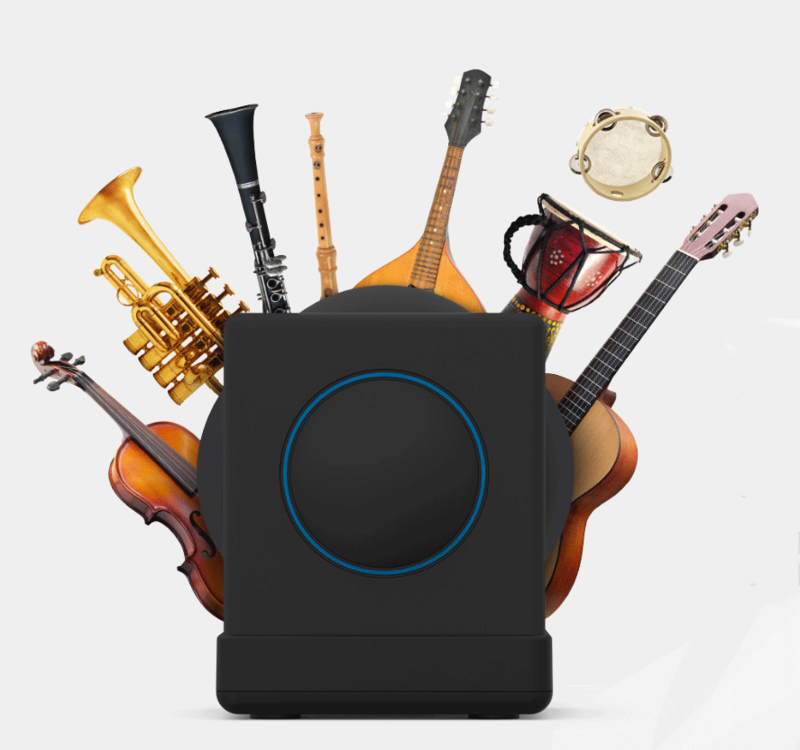 Skoog 2.0 comes with a host of exciting features - including the ability to play wirelessly via iPhone & iPad, as well as integration with iTunes and Spotify to allow users to play along with their favorite music. Skoog integrates with GarageBand and other MIDI apps making it ideal for musicians of all abilities, as well as being the go-to instrument for educators, music therapists and assistive technologists, too. Skoog is a hands-on accessible music instrument that will change the way you and your students enjoy, create and learn music. It’s a powerful, fun music interface for iOS that opens up a world of interactive music to people with disabilities. Whether you tap it, twist it or squeeze it, the sensor living at the heart of Skoog detects how you squeeze and activate the foam – it’s not just sensitive to how hard the Skoog is being touched, but where and how it is being touched, transforming the things you do into meaningful and expressive sounds. Adjustable sensitivity means that you can play Skoog intuitively with any part of your body: hands, elbows, knees or head. Whatever your skills, abilities and musical talents, the universal design enables accessible, expressive music making for children, parents, teachers, musicians and families. Requires: iOS 7 or later, or Mac OS X v10.6 or later. The Skoog is fully portable and set up is easy. Simply launch the software and you are ready to play. Select from a range of instruments; clarinet to congas, voice to violin... even a space bass. Give a new twist to a hit song with Skoog Skores, or record and layer your own tracks. The Skoog is completely compatible with GarageBand and Logic so you can access an even bigger universe of instruments, sound effects and tools. Tap it. Shake it. Squeeze it. Give it a little twist. Just plug it into your computer's USB port and play. Whatever your musical skills or physical ability, the Skoog software allows you to customise the instrument's sensitivity to suit your playing style, which means that anyone can rock out to their favourite tunes, or use programmes like GarageBand to open up a new world of amazing music and sound. BBC Skoog – music, technology and special needs makes the news! Our simple and beautifully designed software has a few tricks up its sleeve too. Choose from "Physical modelling synthesis", "Tap", "Press" or "Squeeze" sampling instruments, or connect to GarageBand, Logic and other compatible MIDI devices and applications to open a whole world of new sounds. We have worked closely with educators in both research and practice, and understand the needs of teaching and support staff alike. The Skoog is widely used by children of all abilities and is very valuable to those with profound physical or learning disabilities. Have a look at Stephanie who has cerebral palsy, playing with an orchestra or Samantha, a young autistic person, singing in pitch perfect tones to the exact rhythm of her favourite song. We’re very proud that the Skoog is now being included by UK Local Education Authorities and Music Hubs as part of their SEN and mainstream music curriculum. It’s now our mission for ALL young people to enjoy creating music using Skoogs. "I have seen children empowered by the music they have created on the Skoog. It can be used as a communication aid to learning phonics, sequencing activities making learning fun. 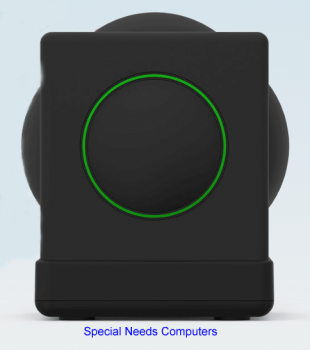 As well as being fun, the Skoog is easy to use, even for a non-techie like myself!" "Skoogs are a fantastic musical resource that enable all young people to access music making in a creative and stimulating way. We are looking forward to developing the use of this instrument with both staff and SEN pupils throughout Lancashire." For those with Autism the Skoog provides an alternative means of communication and encourages participation, sympathetic engagement and social skills through melody and rhythm. "I have had the privilege to observe and support the development and use of assistive technology for musicians over a period of more than 15 years. In the belief that this represents a vital new frontier for the creation and performance of music, irrespective of 'ability', I have made it my business to try to bring such new instruments and, most recently, the Skoog into the public arena with performances on major platforms. These have included the St Magnus, City of London and Setúbal Festivals, all of which I have directed over the past decade. The Skoog is a musical instrument designed not only for young people with restricted mobility to develop their skills, its primary purpose, but also for any musician to play at the highest level, adding to the richness of their musical palette." Table Top Suction Mount for Skoog provides strong and stable mounting. Cradle securely holds Skoog steady while it’s in use. 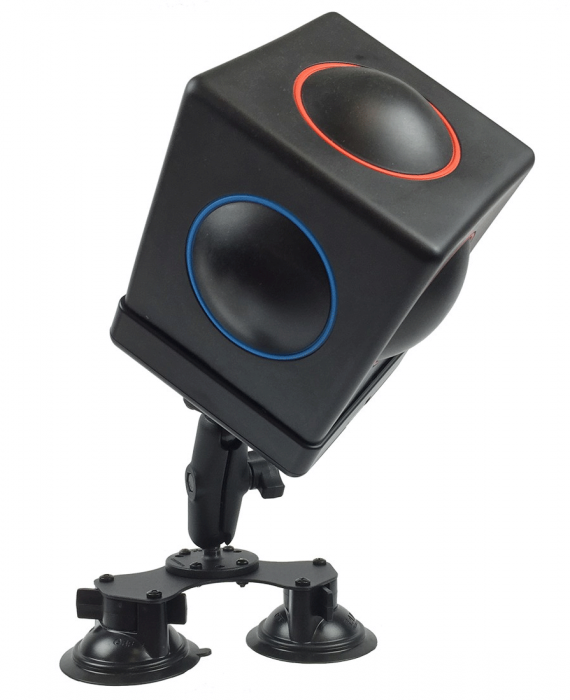 Dual suction cup base provides strong and stable mounting for your Skoog.